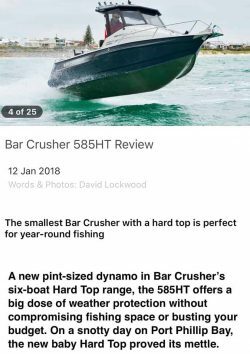 A new pint-sized dynamo in Bar Crusher’s six-boat Hard Top range, the 585HT offers a big dose of weather protection without compromising fishing space or busting your budget. On a snotty day on Port Phillip Bay, the new baby Hard Top proved its mettle. We arrived at the busy Bar Crusher factory, our head spinning like a lighthouse as we set our eyes on one cool new boat after another rolling out of this Dandenong yard. Then we sat down for the best part of a typical blustery Melbourne day to talk plate-alloy boat building. Bar Crusher has been busy, as we relayed in this resulting story titled Bar Crusher: In the Spotlight. Plate-alloy fishing rigs are a big driver of today’s booming coastal trailerboat market. Hard top models are especially popular, not only in the weather-challenged bay and inshore fisheries of our southern states, but also in diverse coastal regions right around Australia. It’s almost like we’ve rediscovered our favourite Aussie-boat style here – a plate-alloy hard top – just like the pro fishers have been using for decades from Tassie to the Top End. Of course, weather and sun protection in a small alloy fishing boat makes a lot of sense. A well-designed plate-alloy hard top doesn’t lose a lot of fishing space, either. But you get a more substantial enclosure than a bimini top and you’re not looking through foggy clears or copping spray in the face as you button the bow down and head offshore.